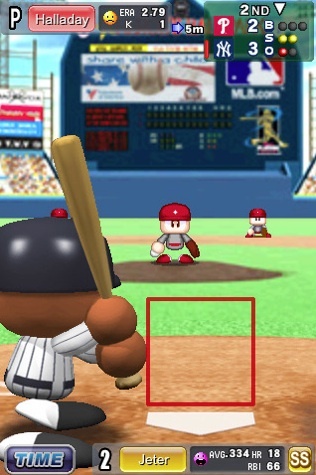 Konami's pint-sized sluggers return for more on-the-go baseball. MLB Power Pros Touch 2010 features a lot of the fun elements that made last year's iPod Touch/iPhone game a huge success, along with a couple of new components for avid baseball fans to check out. Just don't expect an original experience. This year, MLB Power Pros Touch 2010 has the full Major League Baseball license. Not only are all 30 teams present and accounted for, but all of their players as well, including the likes of Prince Fielder, Matt Halladay and Ubaldo Jimenez. Granted, it's not really them on the field, but pint-sized, super-deformed characters without noses and mouths. That's fine by us, as their eyes give off a number of expressions. Cheery, frustrated, excited...you can sense it all just by looking at these guys. In addition, you'll have no problem setting up pitches and swings, thanks to a user-friendly touch screen interface. Base-running and stealing controls are also available, but you might want to start these off on Automatic until you get a hang of the mechanics. Fortunately, the computer doesn't mess around, so it won't go for squeeze plays unless you call them. Mode-wise, MLB Power Pros Touch 2010 comes up a bit short. You've got a quick Exhibition mode, a Season mode (where you play through 25, 50 or 162 games), a Custom mode (where you rearrange your own MLB dream team and take the mound) and a new wireless mode, where you can play against a friend locally via BlueTooth. Multiplayer worked fine, but we would've preferred Konami to throw a few extra modes our way. Like a Home Run Derby, perhaps. In terms of presentation, the character animations are cute and colorful (we love how they get mad when we swing and miss) and the playfields, as limited as they might be, fit the bill. Finally, the audio is good as well, with fun little music bits and sound effects, but the announcer wears out his welcome. He's almost too excited. While MLB is a solidly built baseball game, a lot of this stuff was previously done for the first Power Pros title. More changes would've made this worth the money, but as it stands, it's hard to pay eight bucks for basically the same thing. If you didn't get the original, it's worth checking out. If you did, weigh your options and then make the call. What's Hot: Features official MLB licensed teams and players, easy to pick up and play, Bluetooth-supported multiplayer, cute presentation. What's Not: Very similar to the original MLB Power Pros Touch, modes are somewhat lacking, over the top announcing, a bit pricey.